There's no sophomore slump here - in its second season premiere, Rick and Morty remains weird, wacky and resolutely wonderful. One episode was provided for review purposes. “Who cares about the *belch* thing you guys are talking about?” Words to live by, Grandpa Rick, words to live by. 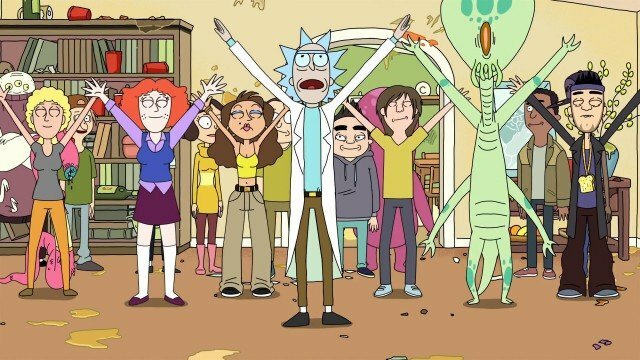 In the second season premiere of Rick and Morty, the weirdest and unquestionably one of the best animated comedies on television hasn’t missed a beat – even though it’s been over a year since the brilliant first season ender aired, “A Rickle in Time” puts viewers back in the same giddily amused mindset within seconds. 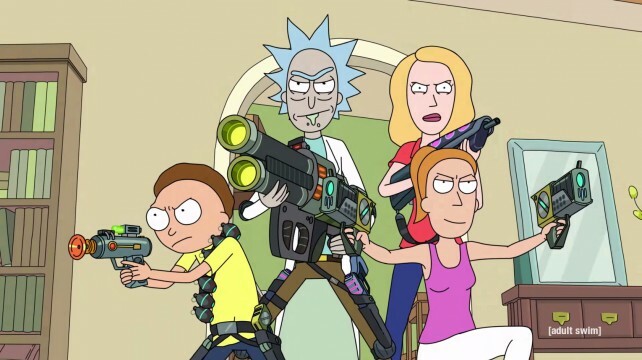 Rick is still a brilliant monster, prone to unleashing firestorms of smart-aleck abuse on his simple-minded grandson Morty and granddaughter Summer; Morty is the hapless kid who idolizes him nonetheless; and parents Jerry and Beth remain the same distracted, vaguely dissatisfied couple we know and tolerate. Rick and Morty also (thankfully) hasn’t lost a drop of its dark and deranged ingenuity. In the premiere, Rick’s attempt to unfreeze time after doing so to clean up the aftermath of a season 1 party hits a snag when his grandkids express indecision, leading to time splitting into multiple dimensions, Sliding Doors-style. Eventually, they’ve messed with time so much that it’s divided into dozens of possible timelines (this is depicted by the screen splitting into tiny frames, each containing one potential timeline), and Rick’s concerned that one of his parallel-universe selves will just blow the rest of them to kingdom come and save his own skin to actually fix everything. It’s not hard to discern from the episode an excited uncertainty on the part of creators Dan Harmon and Justin Roiland. After all, Rick and Morty is coming off an exulted freshman run that’s considered one of the strongest first seasons of any comedy series in recent memory, and the pair are now faced with the unenviable task of avoiding the sophomore slump. In that sense, perhaps a story juxtaposing Rick’s vicious decisiveness with his grandkids’ ambivalence was the natural way to go. The episode reverberates with cheeky self-awareness. And that Harmon and Roiland tackle it in a very Rick and Morty way, complete with time cops and biting one-liners, is just another proof that they understand exactly what makes their show work as well as it does (which is a surprising rarity in writers’ rooms).